Grab a shake before the sock hop this Halloween in this 50s Pink Poodle Sweetie Adult Womens Costume. 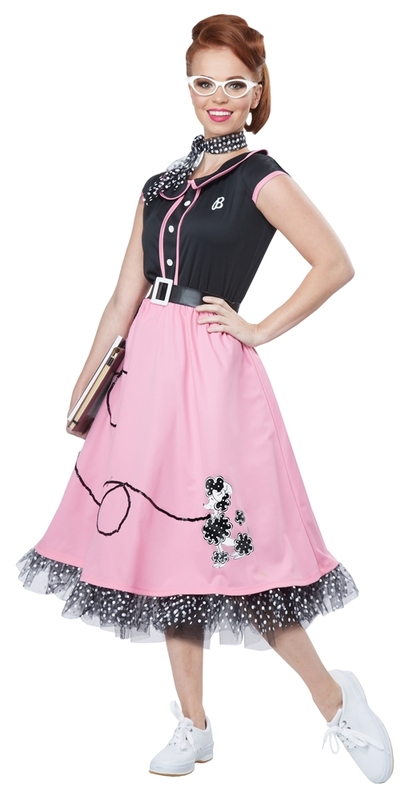 The 50s-inspired women’s costume includes a dress, pettiskirt, scarf, belt with buckle, and iron-on monograms. The costume dress consists of a black top and pink skirt. The top is detailed with pink trim down the front, collar, and sleeves. The pink skirt is decorated with a screen-printed black and white poodle and a black sequin leash. The black, mesh pettiskirt and scarf are detailed with white polka dots. The faux leather belt features a white buckle and secures by a velcro patch on back. The white iron-on monograms allow you to personalize your costume to your liking. Take a trip back in time in this women’s 50s costume.